Anyone who has a travel bucket list likely has two things on their agenda: Alaska and Whale Watching. 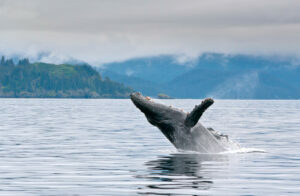 Why not combine the two with a Juneau, Alaska Whale Watching adventure? 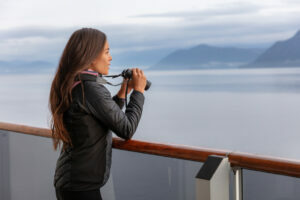 Whether you’re cruising through Alaska or are just visiting by plane or car, you can still join a shore excursion of a lifetime to go whale watching in Juneau. 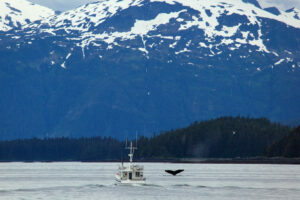 Why Go Whale Watching in Juneau on a Tour Boat? Here’s the scoop on what you should know and look for before whale watching in Juneau. Many travelers assume they can just stay on their cruise ship for spectacular whale watching in Juneau. But in reality, they could easily miss out on an amazing experience of getting up-close and personal with these amazing animals. Cruises leave plenty of opportunity to spread out, enjoy the amenities and onboard entertainment and dining but small whale watching boat tours are unmatched for getting eye-level with the whales. After all, whales are also known to swim up near a small tour boat in curiosity or rub their belly on the underside of the boat. Downtown Juneau is a perfect stop for sightseeing, food, and fun, but there’s more to see and do just a short drive away where Auke Bay harbor awaits. Travelers embark on a whale watching tour for the unique opportunity to see humpback and orca whales, Dall’s porpoises, steller sea lions, harbor seals, bald eagles, and more. And once onboard the boat, guests relax while a captain leads the way to whales and other wildlife. The tour guides are highly knowledgeable about the area and the social circles of whales to show you where they congregate. And beyond whale watching in Juneau, a tour should also educate visitors on the habits of the whales and daily life in Alaska. It’s a fun and interesting way to learn something new with the opportunity to see whales playing or feeding nearby. The big question is what time of year travelers should go whale watching in Juneau to get the most out of their vacation experience. Travelers with flexibility should look to the months of June, July and August when whales are the most active and easier to find. But that doesn’t mean you won’t find the first whales of the season arriving in April. 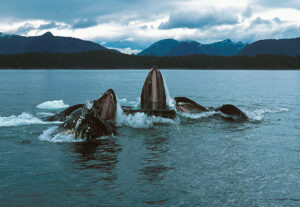 These majestic humpback whales gather near Juneau and southeast Alaska after a long journey from Hawaii. The whales head to the islands to breed or have their calves all winter long. Instead of staying in Hawaii’s warm waters, the whales come to Alaska for the long periods of daylight and nutrient-filled water. They also nurse their calves throughout their long journey. Once they arrive in Alaska, the young calves learn to feed, swim, and get their flukes up for diving. Although those summer months can be ideal for whale watching in Juneau, there’s also nothing like seeing those baby whales practicing their new skills and getting their tails going. It’s a shore excursion you’ll never forget. Unlike other wildlife excursions where the animals might be snoozing through the day, whales are cetaceans and have an incredible way of sleeping. According to Animal Planet, it’s believed a humpback whale’s brain actually allows them to sleep with just half of their brain, while the other half is still active. That’s good news for tourists looking for the “best time of day” to see the whales. It turns out, any time is a good time! Rain also isn’t usually a factor when it comes to whale watching, so there’s no need to monitor the daily weather for precipitation. Most whale watching tours will run whether it’s raining or not, and are accustomed to hitting the open sea in a variety of weather. However, rough waters and winds might warrant a cancellation or delay. Regardless of the time of year or day you take a whale watching tour, make sure it has a naturalist or highly seasoned guide to tell you exactly what to watch for including the whale’s blow, or spout. On a drizzling, overcast day, you can see the whales blowing for miles away, but sunny days are actually harder due to the glare off the water. Another reason why a rainy or overcast day may be an ideal time to take a tour. Ask the naturalist what to look for on your tour, and about spyhopping when the whale treads water and looks at what’s just above the surface. Whales also like to tail-lob, pectoral slap, and might even breach the water or sail through the air in a soaring jump. Whale watching in Juneau is an experience of a lifetime for animal lovers, adventurers at heart, and anyone looking for a unique excursion they’ll never forget. Just make sure to bring a fully charged camera, you won’t want to miss a single shot. Last year when Royal Caribbean launched the new non-refundable deposit cruise fare, it included two incentives. The first was a lower cruise fare. The second incentive was an onboard credit of $25 to $100 per room, if the booking was created 6 months or more before sailing. How Do You Pick Your Preferred Cruise Lines?